Interesting how motorcycle riders get all pumped up for summer and visions of rides past and rides-yet-to-be dance in our dreams. Unfortunately, before we get to our good riding months on the Canadian west coast, we must endure ‘Junuary’. That time of year when the weather from May (which is usually quite warm) deserts us and the furnace kicks in again at night. 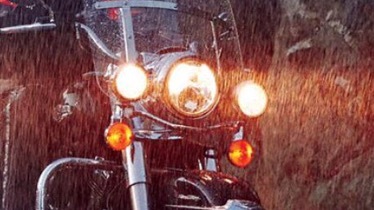 Cool, wet weather moves in and riding becomes hit and miss in my part of the country. I should know that living in a coastal rainforest means precipitation, and every year Hubby puts up with my grousing about wet weather. It doesn’t make it any easier when it arrives. The trade off will be in July and August when temperatures soar into the high 30s and low 40s (80-90 for Fahrenheit people) and riding is a daily occurrence. For now I will just quietly sit in my chair by the window muttering into my tea cup and glaring at the rain clouds out the window. Bahhh humbug.